You Are Here: Home → Can’t Fathom Saying Goodbye to Meat? Be A Weekday Vegan! Have you ever thought about going vegan but can’t fathom giving up your old favorite foods? There are many approaches that can empower you to take massive steps toward vegan living without going “all the way” just yet. There’s Meatless Mondays for those who want to dip their toes in a tiny bit. Well-known food journalist and NY Times columnist Mark Bittman authored a book called VB6 (about eating began before 6:00 pm). And today we’re presenting yet another approach—and one of our favorites yet—the “Weekday Vegan” approach! 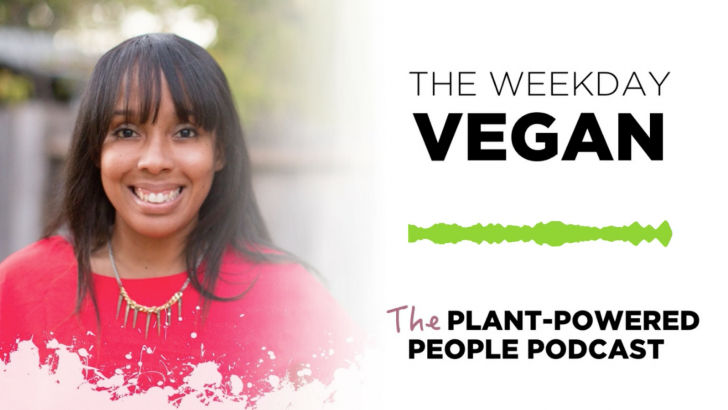 In Episode 2 of the Plant-Powered People Podcast your hosts Michelle Cehn and Toni Okamoto talk with their friend and neighbor Crystal Young about how the Plant-Based on a Budget Meal Plan challenge changed her diet from meat at every meal to eating plant-based 5 days a week. We talk about incremental progression and how Crystal’s meat-loving husband—who is also the chef in their kitchen—is handling the change. Enjoy! Feeling inspired? If you’ve been thinking about going vegan but can’t bear the thought of never again having your favorite burger, why not try Crystal’s approach and start by becoming a Weekday Vegan? That way you can learn the ins-and-outs of vegan eating and become a pro at plant-based cooking without having to think about saying goodbye to your old foodie favorites. And who knows, perhaps you’ll feel the way Crystal does—so good during the week that she wants to take it further! Hungry for more from the Plant-Powered People Podcast? You can read the show notes here and subscribe on iTunes, Spotify, or wherever you listen to podcasts. This article contains affiliate links which help us keep the lights on at World of Vegan. This post is not sponsored, and we only share products and companies we sincerely adore!